Here it is. So long awaited, College Football has finally arrived in the promised land. While the inaugural College Football Playoff has had obvious flaws that need to be addressed, it also delivered a terrific weekend of football and gave us a National Championship Game that would not have been possible with the BCS system. Here’s what to watch for Monday night. The most important player on a football team is the quarterback. Like it or not, that’s the reality of American Football. Fortunately for fans and the broadcast networks, this game features a couple of studs. 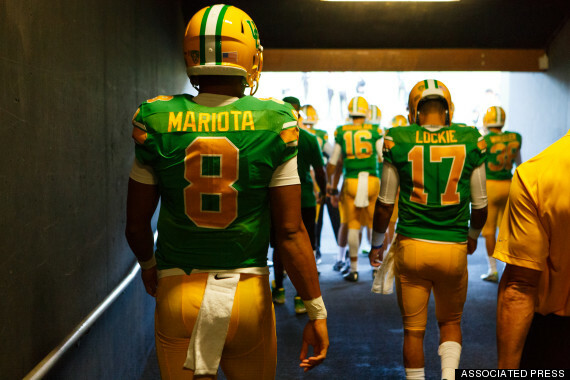 What’s left to say about Marcus Mariota? He has been nearly perfect this season, and has all the intangibles NFL coaches look for. The biggest complaint about him? He’s “too nice”. Considering all the other issues college quarterbacks have had coming into the NFL, I don’t think that’s going to knock him down too much. The scary thing is Mariota didn’t play his best against Florida State on New Year’s Day, and Oregon still steamrolled FSU. Although Mariota is the best player on his team, in his conference, and in the nation, Oregon is a complete team with a stifling defense, a powerful offensive line, and a stud running back in Royce Freeman. Ohio State is either the greatest quarterback recruiting school or insanely lucky. Cardale Jones has stepped up admirably from a third string benchwarmer to a potential National Champion. Jones reminds me of Colin Kaepernick in many respects. He has a cannon arm and can throw the football a mile with the flick of the wrist. He is a big Quarterback who can run through tackles and has surprising speed. Not as fast as Kaepernick, who’s long strides carry him past defenders with ease, but faster than you would expect nonetheless. While difficult to take down, Jones has almost no pocket presence and rarely feels pressure coming from the blind side. He takes too many sacks, a major drive killer. Jones has risen to the occasion during each of his two career college starts. He wasn’t asked to do much in a 59-0 steamrolling of Wisconsin, but it was absolutely imperative that he show up against a team ranked No. 1 at the time in a win or go home situation. It was not an easy win over Alabama for the Buckeyes, and Jones wasn’t perfect. But he made enough plays when necessary and has enough teammates around him to make this a very dangerous Buckeyes squad. While Jones and Mariota garner most of the attention, Oregon and Ohio State have several other players who could make a big impact on this game. Royce Freeman and the Oregon offensive line have already been mentioned. Keep an eye on Oregon wide receiver Byron Marshall, Mariota’s favorite target. OSU corner Eli Apple did a nice job on Amari Cooper, limiting him to 71 yards despite two touchdowns, and Cooper was a far tougher test than Marshall will be. However, Oregon’s offensive scheme will look to utilize him in a variety of unusual ways. For Ohio State, running back Ezekiel Elliot has turned heads around the country as he has carried Ohio State in several big games this year. He was the one who put Alabama away with an 85 yard scamper in the 4th quarter. Ohio State has put themselves in this position with their suffocating defense, just as Oregon has worked their way to Dallas through their overpowering offense. Should be a classic in Dallas at JerryWorld (aka AT&T Stadium). 72 hours to kickoff! Arizona came out the gate strong in 2014, their ferocious defensive fire fueled by the fact that they were left out of the 2013-14 NFL Playoffs with a 10-6 record. Despite losing linebacker Daryl Washington and defensive tackle Darnell Dockett for the entire season, Arizona was a dominant team from the start of the season until Carson Palmer and Drew Stanton went down with leg injuries. The rise of Michael Floyd, Tyrann Mathieu’s comeback from an ACL tear, and the contributions of a revamped offensive line and rookie safety Deone Bucannon raised the Cardinals to the top seed in the NFC before they fell in the standings due to a rash of QB injuries. Rookie Logan Thomas has potential and possesses great arm strength, but the former Virginia Tech passer is not ready for the NFL. 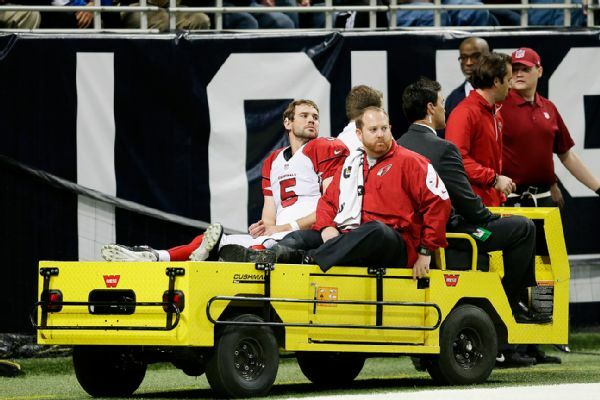 With starter Carson Palmer out for the year with a ACL injury, backup Drew Stanton was thrust into the starting role. Stanton was a mixed bag as a starter, but he was competent enough to give the Cardinals a fighting chance in any game they played. With Stanton’s injury, Arizona was left with Ryan Lindley, career backup, and Thomas. 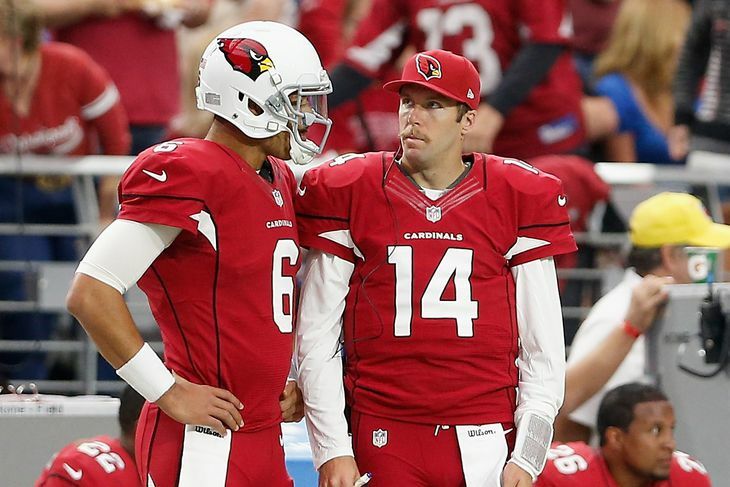 Head coach Bruce Arians has decided that Lindley is their best bet at QB right now. Lindley hasn’t exactly impressed. The Cardinals lost the last two games of the season and come into the playoffs without much momentum. The Cardinals lost to the mediocre 49ers and Lindley telegraphs his passes too much for the Cardinals to win this game. Their opponents, the Carolina Panthers, are considered somewhat of a joke as they were division champions with a losing record. That won’t matter in this game, as a revitalized Cam Newton destroyed the Atlanta defense in a decisive Week 17 victory that pushed Carolina into the playoffs. Carolina is also a flawed team, lacking great receivers or a decent secondary. Carolina’s mediocre season, however, ended on a high note as they embarrassed Atlanta on the road. Carolina’s huge advantage is that Ryan Lindley is incomparable to Cam Newton. Bruce Arians is a great coach, and the Arizona Cardinals have a great team, but the quarterback issue is a problem without a solution. The Redbirds will fight for 60 minutes and then some, but they lack the offensive firepower to advance to the next round. Leg injuries to Carson Palmer (3) and Drew Stanton (5) have left the Cardinals without a quality signal caller. Coach Bruce Arians feels that Ryan Lindley (14) is a better option than rookie Logan Thomas (6). If I had only listened to my Uncle Dave, I might have had more success in picking the winners in the first two playoff games in the inaugural College Football Playoff. He is an absolute football guru with incomparable football knowledge. But seriously, who was expecting that? Florida State’s collapse was the result of 4 costly turnovers in the third quarter, turning a 25-20 deficit into a blowout of epic proportions. Known as second half team, Florida State did well enough to keep within striking distance for one of their signature comebacks. I said in my earlier column that Winston would have to play mistake free for FSU to win this game. He was far from it. To be fair, his team did not help him much at all, fumbling often and dropping very catchable passes. But at the same time, everything seemed difficult for Winston. He made tough throws that didn’t need to be that hard. And as everything collapsed around him, Winston imploded as well. A turnover filled third quarter sank FSU before they had a chance to do anything in the fourth. Winston will go out on a sour note with the only loss of his college career coming in his final game. On the other side, everything seemed fluid and easy for the ducks and Heisman winner Marcus Mariota. By the end of the game, Florida State’s defense quit on themselves, allowing anyone wearing green to slash through them for 25 yards or more. Oregon blew past Florida State defenders that were always a step slow, running over and around anybody in a gold helmet. Mariota played well, but Oregon’s defense really dictated the outcome of this game. Whether Winston could match Mariota pass for pass and play mistake free football-Failure on multiple levels. He wasn’t given much help, but he was unable to rise above the adversity. Whether or not Florida State’s vaunted defensive line could contain Mariota and Oregon running back Royce Freeman- Florida State’s D-Line failed to properly defend the option and they looked lost and confused against the many facets of Oregon’s offense. The game became a blowout due to Florida State’s inability to get out of their own way on offense and how uninspired their defense played. The real shocker, though, was the Sugar Bowl down in Louisiana. The underdog Ohio State Buckeyes, who squeezed into the CFP at the last minute on their third quarterback, versus the Evil Empire led by Sith Lord Darth Saban, the ALA-BAMA CRIMSON TIDE! Outside of the extremely devoted faithful of The Ohio State University, few predicted a Buckeye victory in this one. 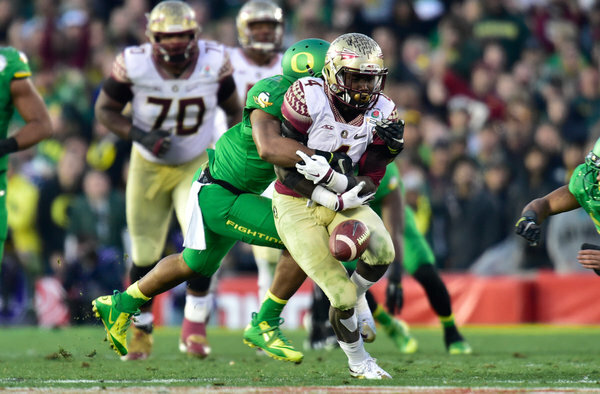 I went against the grain in picking FSU over Oregon, but I thought this one was a slam dunk. The tide had been rolling since a narrow victory over Arkansas early in the season and they looked unstoppable up until they experienced a humbling loss that evaporated their National Championship dreams for the second straight year. As for the Buckeyes, they were on their third string quarterback and had little in the way of nationally recognized star power. Sims, Cooper, Henry, and Yeldon seemed to be an unstoppable force, but the Ohio State defense stepped up in a big way. In fact, the whole team rose to the occasion. Evan Spencer had a key onside recovery on special teams and even threw a touchdown pass on a trick play. Ezekiel Elliot averaged 11.5 yards per carry and had two touchdowns, including an 85-yarder that put the Buckeyes ahead for good. Cardale Jones made some mistakes, but he also had a few plays that impressed. The Buckeye defense played well down the stretch, intercepting Alabama Quarterback Blake Sims three times. Sims has played well this year, but he has had some ugly games. Sims wasn’t horrible, but it wasn’t enough versus an Ohio State Defense that bent but did not break, and contained Amari Cooper to 71 yards on 9 catches. Overall, Ohio State managed a shocking upset by playing together, as a team, rather than relying on a few key players. Ohio State now faces another seemingly perfect team. They haven’t let being an underdog stop them in the past. I doubt they will let it affect them in the future.